Just thought I’d drop you a note to let you know how the fishing went on 4 July with Ed McCoy. I found Ed to be a really nice guy to get on with. His knowledgeof the river and fishing skills were outstanding. He made me feel at ease,nothing awas any trouble even when catching rhe trees when casting!! Taking Ed’s advice, we went fishing in the evening. Fishing at night was a totally new experience for me and I thoroughly enjoyed it. The fishing was awesome!! I would have no hesitation in recommending you to anyone who is looking for an unfogettable fishing experience. 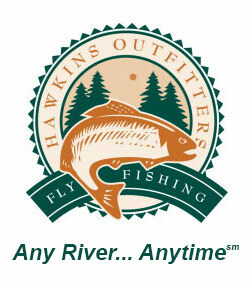 A note of thanks for Jon Ray, Ed McCoy and everyone at Hawkins for providing our group with a most memorable trip in November for Michigan Steelhead on the fly. We knew we had found nirvana when you “showed us the way” to fish Steelhead on the swing with streamer patterns. We also knew we had found a group of guides with unequaled integrity when the weather did not cooperate on one of our planned days out. You gave us the opportunity to cancel the day knowing the elements would have won out, others would not have made such a sacrafice. Your patience was much appreciated when instruction was needed and most of all thanks for having a sense of humor, it fit our group to a “T”. I would like to add that it is very special to our group to fish with true conservationist and folks that like to talk about the future of this great sport in Michigan, for that you deserve a great deal of respect. The gear and accomodations were top shelf, we are all looking forward to 2008 Steelhead fishing with Hawkins. Do you want to instill in your children a love of the outdoors and respect for the environment? Put them in a boat with Chuck Hawkins and teach them how to fish! My kids and I have fished with several guides over the years and I can think of none better than Chuck. Chuck had great patience in helping my 6 year old son to cast and strip flies efficiently resulting in my son’s first (albeit small) unassisted steelhead. I have enjoyed many fine days in Chuck’s boat and in his company. Chuck has terrific instincts, knows the water and best of all is easy to be around. I cannot recommend Chuck more strongly to anyone who wants to not only enjoy a good day of fishing but also if you don’t mind learning a few things for yourself or your kids along the way.